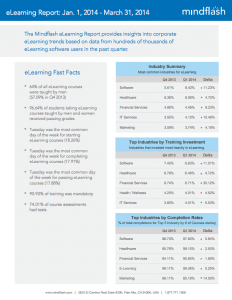 Online training company’s survey from the first quarter of 2014 shows Software as the top industry for eLearning use and spending, with Healthcare and Financial Services close behind. Palo Alto, CA—April 29, 2014—Mindflash has released the results of its latest research on corporate eLearning, based on data from hundreds of thousands of eLearning users. Highlighting user trends based on industry and geographic location, this is the fourth report released by Mindflash, a leader in online business training software. California again took the spot among states for training, based on percentage of users (21.64%), followed by Massachusetts (11.12%) Illinois (9.49%) Georgia (6.79%) and Florida (6.7%). In Q4 of last year, the top states were California, Mississippi and Illinois respectively. Software surpassed Healthcare to become the top industry for eLearning (based on percentage of companies) followed by Financial Services, IT Services and Marketing. Software was also the industry that spent the most on eLearning, followed by Healthcare, Financial Services, Health/Wellness and IT Services. The report showed trends around course design and use, too. For instance, short courses are in favor. Most courses (nearly 60%) were 30 minutes or less in length. The number of slides included in the average course, however, was across the board: 25% had 10 slides or less, 33% had between 11 and 25 slides and 25% had between 26 and 50 slides. Finally, a large majority (75%) of courses included an assessment for learners. The full survey results are available here. Survey results from Q4 are available here. Mindflash provides the leading online platform for employee and customer training. Its cloud-based, simple yet powerful design allows businesses to more easily create and manage critical company training programs—saving them significant time and money. No engineering or IT support is required, as there is no software to install or maintain. Courses are created using the file types that businesses already use (PowerPoint, PDF, Word, video, audio). Trainers simply upload and organize files using an intuitive course dashboard, add quizzes and then publish to the web to create self-paced new hire training, sales training, customer certification courses, etc. As needed, the software scales to support thousands of simultaneous training sessions. Mindflash has over 1,000 customers including McDonalds, Microsoft, Lufthansa and Four Seasons Hotels and Resorts. Founded in 1999, Mindflash is a privately held company and headquartered in Palo Alto, Calif. To learn more, please visit www.mindflash.com.